What does it mean to destroy a building? 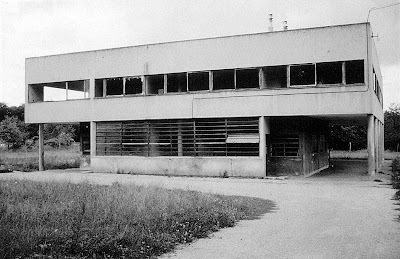 How do we read a damaged version of Le Corbusier's Villa Savoye at Poissy? For architecture historian Andrew Herscher, destruction is a type of language, a "form of design" that is "at least as significant as any of the elements from which buildings are constructed for living, for the living." But let us take this further. If a building calls attention to itself when it has ceased to exist, is there a middle ground, an intermediate representational stage that not only forecasts a language of destruction, but that also evokes the purely conceptual urgings that inspired the design of the building in the first place? 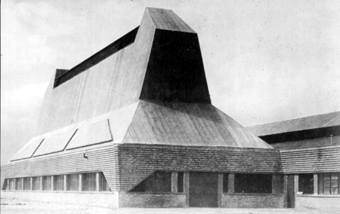 Some images of Erich Mendelsohn's buildings will begin to shed some light on this question. 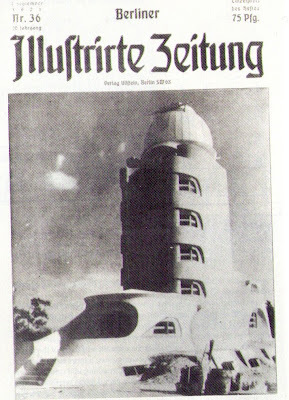 Erich Mendelsohn, Einstein Tower on Front Cover of Berliner Illustrierte Zeitung (1921) (Source: Klaus Hentschel, The Einstein Tower, An Intertexture of Dynamic Construction, Relativity Theory, and Astronomy [Stanford UP, 1997]). The first image, from a 1921 of Berliner Illustrierte Zeitung, is one of the first ever taken of Mendelsohn's Einstein Tower (1921-1924). Here, Mendelsohn's signature expressionisms become fully visible. Sweeping, curved surfaces wrap around the building, creating volumes that bleed and dissolve into each other. A dark shadow covers the building's entire front facade. The lighting creates a high degree of contrast with the building's white wall. This contrast also highlights the Tower's exaggerated forms. The curved walls and apertures now stand out even more because of the lighting, giving a sense of how Mendelsohn's most famous building is a volume quite literally carved from space. The second image, taken after the German surrender in 1945, shows the extent of bomb and artillery damage during the Second World War. It is interesting to note that this picture was taken from almost the exact same vantage point as the photo from Berliner Illustrierte Zeitung. The degree of contrast in both photographs is nearly identical. However, in the latter photograph, the white walls are anything but. Smoke damage and paint flecks mar the otherwise smooth surfaces. The window mullions are also broken or missing, their glass blown out and strewn throughout the site. Debris covers the front entrance and grassy slopes on the side of the tower. 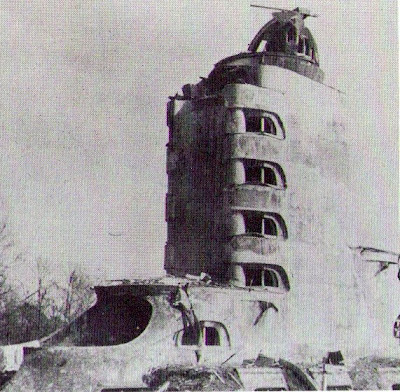 The image of the destroyed Einstein Tower fascinates for its ability to recall Mendelsohn's original sketches for the building. 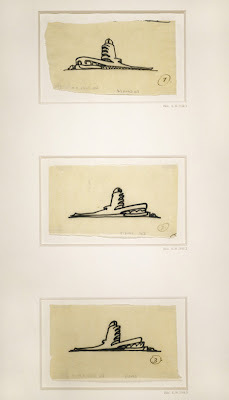 As in the photograph from 1945, the sketches reveal the lenticular dome atop the tower as a broken and incomplete form. 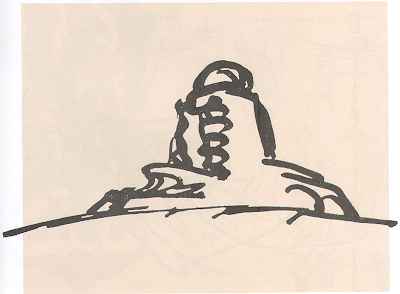 The ground seems incomplete and upturned in the sketch, much in the way it would appear in the second photograph. Is it possible that the building, when damaged and eviscerated, speaks more to the architect's vision than a completed building? The form of the Einstein Tower has withstood damage, but it is a form that has become reduced to its constituent lines of force. Strangely, the bomb blast, with its incredible displacement of pressure, earth, and energy, makes the building more legible. But is this because we are filling in the blanks, completing the forms? Are we visualizing a completed dome atop the building even when we look at the image of the damaged Einstein Tower? Mendelsohn's Hat Factory at Luckenwalde (1921-23) shows a different type of damage. The original, tell tale hat-like form is clearly visible in the more recent photograph. Originally built as a dyeing facility, Mendelsohn's main hat-like structure became a munitions assembly plant under the Nazis, as well as a textile plant under East German oversight. 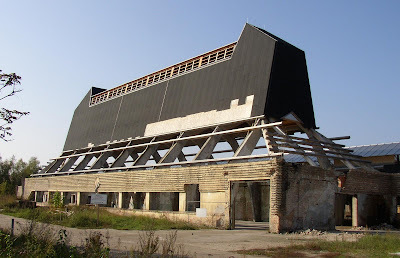 Since 1990, the German government has identified the building as a national landmark and begun to restore it. The building has been gutted during this process. This act of dismantling -- a type of damage that is commensurate with the process of historic preservation -- has revealed the building's original poured concrete spans, facade brick courses, as well as some of the wood framing. If damage has made the Einstein tower's form more legible, then in the case of the Hat Factory, it has made the structure readable once again. Andrew Herscher, "The Language of Damage", Grey Room 7 (Spring 2002), p. 69. I think what is interesting to note is that the "destruction" in the latter two buildings is man caused where as the "destruction" in Corbu's Villa Savoye, as well as many of his and other modernist buildings, was caused by the lack of consideration to context. Placelessness achieved... Timelessness not so much. dude. it's a sketch! and it does NOT show the dome as incomplete or the ground as incomplete. This is really a prime example of how architects (especially those specializing in talkitecture) are pros at making objects speak. The fact is grammars of form are not perfect systems for conveying meaning. An object can be made to say almost anything. As in this (albeit fun and interesting) post, it's all about interpretation and context. Yes ... it's all about interpretation and context. But, representation is an important part of architecture production. Also, I am not an architect. Nor am I a talkitect. I was actually trained as an attorney.